(1) it allows optional maps for geographical & office-plan visualizations in addition to standard 'buddy lists'. 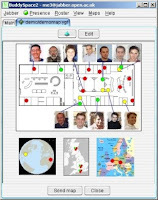 (2) it is built on open source Jabber, which makes it interoperable with ICQ, MSN, Yahoo and others. (3) it is implemented in Java, so it is cross-platform. (4) it is built by a UK research lab, so it is 100% free with full sources readiily available. But BuddySpace is about more than just 'messaging', as we explain below.